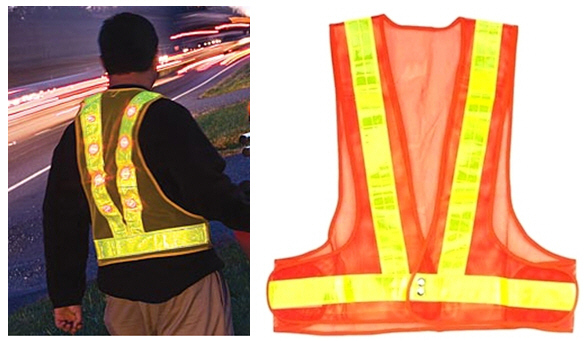 You are purchasing a 10 pack of LED safety vests. Enhanced essential safety equipment for road construction, utility repair, law enforcement & fire, parking attendants, crowd/traffic control and hunters. Perfect accessory for boaters or hikers in a search and rescue situation. The ultimate in making individuals visible in dangerous high-traffic or low-light surroundings. Blaze-orange mesh vest with 2"-wide reflective bands and LED on front and back. 16 flashing-red LED embedded under reflective bands produces glow visible for hundreds of yards. Lightweight & durable construction with Velcro-tab size-adjustment, fits easily over heavy coats. LED flash for up to 25 hours continuous on 3 inexpensive AA batteries (not incl); one-size fits all.